A black and white photograph of Leonard Racher's Lorain power shovel at work dumping dirt into a right hand drive dump truck. Construction workers on the job. Leonard Racher (1909-1951) was a well-known contractor who started L.C. Racher Construction Company of Whitby. 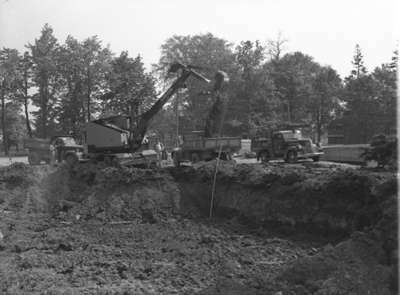 Lorain Power Shovel in Action (Image 2 of 2), May 27, 1948, Marjorie Ruddy. Whitby Archives A2013_040_1174.